Many of the systems within military shipboard systems use the VERSAmodule Eurocard Bus (VMEbus) to communicate. The military uses large infrastructure, lab-based equipment to verify that the subcomponent modules of these systems are ready for issue (RFI). Because of the size and complexity of this test equipment, all subcomponent module testing is performed at a single central location. In an effort to reduce cost in the past, these test systems have been purchased in small numbers and therefore not placed in the multiple locations where they are needed for device testing. This has mandated an increase of logistics expense by requiring acquisition of additional expensive module spares, forcing highly centralized repair depots, and increasing extensive transportation requirements. As a result, bottlenecks and large shipping delays are created as devices are shipped from all over the world to one central point. Also, calibration costs are double for older systems since the newer based systems now call for a two year calibration cycle in their system specifications. This is due to new advances in instrument technology, stability, and repeatability. Combining our experience in automated test and writing functional tests for the DoD, the Navy turned to Orbis to develop a prototype test system that was compact, flexible, and would meet or exceed the existing test system’s capabilities. The prototype was to prove Orbis could utilize modern test equipment and methods for a fraction of the cost of the current tester, without sacrificing functionality. By utilizing a compact Commercial-Off-the-Shelf (COTS) PXI based virtual and/or synthetic instruments, a common test architecture, programming language, and interface, an Automated Test Equipment (ATE) system was designed that provided full functional test and diagnostic capability for multiple modules. There is also significant reduction in capital cost, size, power consumption, hardware maintenance, spares maintenance, and software maintenance costs. These savings can be realized through the reduced Total Cost of Ownership (TCO). Orbis, Inc. developed a compact test system with a comprehensive set of instrumentation and software that can be configured to test custom electronic modules. By using compact PXI hardware, we developed a tester capable of performing the same VME-based functional test used by the military, while significantly reducing size, complexity and total cost of ownership. The new tester would enable the Navy to place test systems at strategic locations, reducing the overall maintenance and logistic costs of the submarine fleet. The Test Program Set for the tester was written primarily in LabVIEW and TestStand. Using these NI based software products simplified the hardware-software system integration effort, since custom drivers did not need to be written. At the start of the program, LabVIEW calls every PXI device, performs a self-check operation, and checks if the calibration date was valid before proceeding with the functional test. Each test was written in LabVIEW and called within TestStand for execution. At the end of test execution, an easily read and exportable XML format report is available for all test data collected. 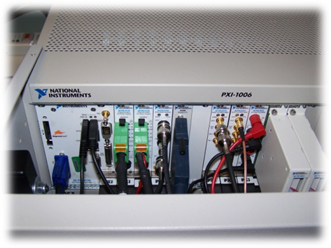 The Orbis Compact Test System is PXI based. The instrumentation is contained within a PXI-1044 chassis that is capable of accommodating future testing requirements. This modular hardware architecture allows for easy expansion and updates to the system. Two PXI-2531 modules were used to create an 8×128 crosspoint switch matrix to connect all points of the PXI measurement modules to the mass interconnect interface test adaptor (ITA). Using the switch matrix, connections were configured as necessary for full functional testing of the unit under test (UUT) that was connected to the ITA. A VME interface was also integrated into the tester and wired to the ITA, providing full testing of the VMEbus for every UUT. The PXI to MXI bus interface module converts PXI control signals to MXI controller signals. 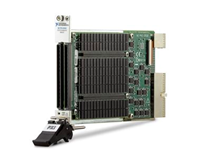 The MXI to VME bus interface module converts MXI control signals to VME controller signals. used independently of or at the same time as each other. The unit and module testing programs are executed on an embedded controller running Windows XP. The system utilizes this instrument for signal acquisition, measurement, and analysis required for testing. The system utilizes this DMM card for voltage, current,and resistance measurements required for testing. 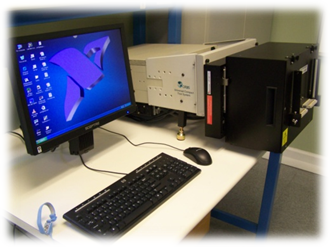 The system utilizes two waveform generators for precise waveform generation in a variety of forms, allowing for more effective analysis during testing. The PXI Counter is a Counter-Timer which is used to for precision frequency and time interval measurement. The system utilizes two PXI-2532 512-crosspoint matrix switch modules. The modules will be combined to create an 8×128 switch matrix used to dynamically route signals via module and unit test fixtures to PXI instrumentation. The Orbis Compact Test System utilizes a mass interconnect system with 128 measurement channels. These measurement channels are situated in a cross point matrix, allowing for fully automatic test switching. This matrix is expandable to 2000 channels. This provides the system the ability to access any test point on a given device with any applicable instrument. Our interconnect system features circuit card assemblies that eliminate the need to custom wire the connections between the test device, measurement instrumentation, and the interface test adaptor. The digital results from each test are stored locally, to allow quick access to test results when they are needed. In addition to being easily accessible, the data is simple to interpret. Headers within the data identify test history and unit sources, and provide intuitive search capabilities. By using a PXI-based test system combined with a custom ITA and VME interface, Orbis was able to design and build a prototype test system called the Compact Tester. The Compact Tester replaces a typical 84ft3 test system with a 12ft3 18-slot PXI chassis test system. At 3x reduction of cost, 15x reduction of footprint and 25x reduction of weight, the savings compared to current test systems were significant. Also, using industry standards for PXI hardware and LabVIEW software, recurring operating and maintenance costs were reduced.